Sail past the stunning skyline along Barcelona’s picturesque coast on this 2 or 3-hour sailing cruise.See Barcelona's most emblematic buildings from the sea (Sagrada Familia church, W-hotel, maritime front with beaches). 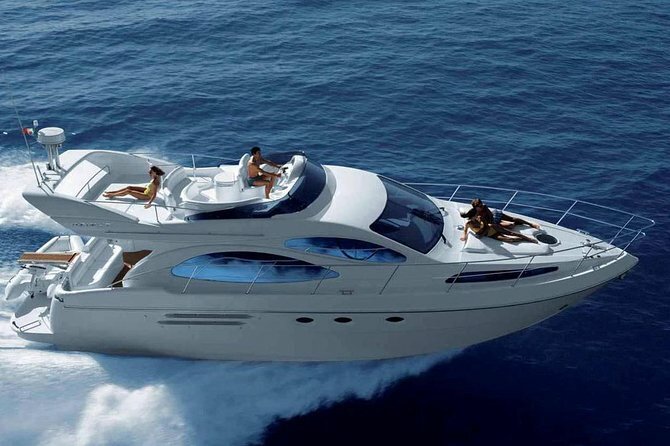 Leave Port Olimpic behind and cruise on the Mediterranean aboard a modern yacht with Fly bridge. Sunbathe on the deck and take in the beautiful scenery as you enjoy complimentary drinks and snacks. Once you’re out on the water, swim and snorkel in the pristine waters. Just came to the boat with your swimming dress. Towels, solar cream, drinks, snacks, champagne will be provided. Begin your Barcelona cruise at Port Olímpic of Barcelona, where you’ll board a modern Motoryacht that fits up to 11 people. After a safety briefing and introduction to sailing, leave the Barcelona harbor and embark on a great day out on the water! Head out on the Mediterranean Sea and follow the picturesque coastline past beautiful spots such as Maremagnum and Barceloneta Beach, W-hotel, Montjuic Mountain, Tibidabo and the impresive Sagrada Familia from the sea. After approximately one hour, your experienced boat crew will anchor and give you a chance to swim in the clear, turquoise water. But remember, this is up to you and your group since you can ask the captain to change the standard plans over and re-design as per your suggestions. Whether you’re celebrating a birthday, an anniversary or just want a fun day out with friends or family, the sailing trip is the ideal option for you. This fun, unique experience will complete any visit to Barcelona. Breathe in the fresh sea air, sunbathe on the deck, relax and listen to your own music (MP3 or iPod) with a glass of complimentary ice-cold soda, beer or wine, and champagne. Note: The sailing itinerary is subject to change depending on the wind conditions.